The developer of the St Luke’s site is Hanover Housing Association. It is a charity specifically aimed at providing retirement housing and continuing care facilities for an older age-group. 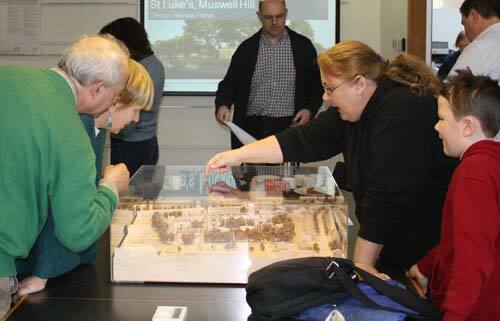 As landlord of the St Luke’s site, it has stipulated that there should be one householder over the age of 50 years in each unit of our proposed cohousing community. This age requirement represents a relaxation of Hanover’s normal rules, but, even so, it raises issues for a group like ours. We are faced with two opposing views in establishing our prices, for example – one, that the downsizing older population is a reliable source of demand that boosts market values, or, two, that any age-restriction in housing depresses its market value. Hanover recently announced that it is marking its 50th anniversary by ‘inviting 10 think-tanks from across the political spectrum to suggest new approaches for policy-makers and service providers’. They are asked to reflect on the implications of an ageing society where older people are ‘fitter, more active and more aspirational than previous generations’. Bruce Moore, Hanover chief executive, writing in the Guardian in early April, recognised that current models of retirement housing may no longer be appropriate for the baby boomer generation who have spent their lives exercising choice. This ‘requires us to question whether there is still going to be a place for age-specific housing’. There is a debate to be had in Cohousing Woodside along these lines. Currently required to be ‘age-specific’, we know that this is a condition that was unwelcome to earlier members. This is softened by the fact that younger family members are welcomed alongside those of 50+ who qualify for membership. We are far from anything resembling a retirement community – even if retirement-age goalposts were also not constantly changing. Will Hanover eventually change its orientation to celebrate its own 50th birthday? Would we choose to specify the 50+ age-range if we were given the choice? There are arguments for and against and it is undeniable that people who have reared their own families, often welcome an environment that is not dominated by other people’s kids. It is clear that, in later life, one can be out of step with one’s neighbours if they are all out at work and you are not. We are determined that Cohousing Woodside will not turn into a ‘retirement community’ but will enjoy a broad mix of younger and older ages, workers, non-workers etc that feels right and balanced.